Part Number WP4449259 replaces: 4449258, 4449259. 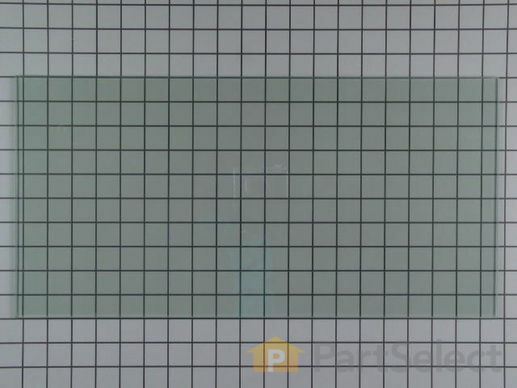 This inner door glass is a heat resistant part that fits into a stove, oven, wall oven, cooktop, or range as the inner glass panel of the appliance door. The glass panel allows you to see the items being cooked or heated in the appliance. Handle with caution and be sure to use gloves, as the door is heavy and the glass is breakable. Do not replace the glass until the appliance is cool to the touch. This genuine manufacturer part is approximately 20 inches by 10 inches. Inner glass door is sold individually, and contains the glass panel only. I broke the door panel glass ! I need to know what part number to order also broke the handle on the oven can't find ! Also does self-adhesive come with that glass! Hello Gerry, Thank you for contacting us. I have researched the model you have provided and have found the part you’re looking for is Part Number: PS11747234 for the outside panel in Stainless Steel and Part Number: PS11747257 for white, Part Number: PS11747258 is black and Bisque has been discontinued. The exterior panels come with eh silver tape. The door handle has been discontinued in all color options sorry. Hope this helps! I need to replace the inner glass door of my oven . What's the replacement part no ? Hello Saleh, Thank you for your inquiry. Part# WP4449253 is the innermost piece of glass that faces the inside of your oven when the door is closed. Hope this helps! Is this the right glass for my oven? Hello Kevin, Thank you for your inquiry. This is the pane of oven door glass that faces the inside of the oven when the door is closed. Hope this helps! Is this inner glass compatible with my oven? Hi Ayman, Thank you for the question. Yes, according to the model number provided this is the correct Inner Door Glass. Hope this helps! Hello Ayman, Thank you for contacting PartSelect. Yes, this is the very inside piece of glass. Hope this helps! Hello Lea, Thank you for contacting us. I have researched the model you have provided and have found the part you are looking for is PS11742543. Have a great day! I broke the inside glass on my oven. The one that is closest to the food on the inside. Can you tell me the product number so i get the right piece of glass? Thanks! Hello Nathaniel, Thank you for contacting us. I have researched the model you have provided and have found the part you are looking for is Part Number: PS11742543. Thank you for your inquiry, good luck with this repair! Hello Dayla, Thank you for contacting us. I have researched the model you have provided and have found the part you are looking for is Part Number: PS11742543.Thank you for your inquiry, good luck with this repair! I need to replace inner glass in my oven, which part do I need? Hello Lidya, Thank you for contacting us. I have researched the model you have provided and have found the part you’re looking for is Part Number: PS11742543 Hope this helps! This is really an easy part to replace. My only tip would to be take tons of pictures as you dismantle the door. There is one tricky part - a pair of mounting brackets for 2 of the 4 pieces of glass. It doesn’t go back together the way you would assume it does so take pictures to refer back to! The glass arrived quickly & well packed. It was the perfect fit. After looking at the video online installation was easy. Would order from here again if needed too. Thank you Partselect. Helpful actual human phone service to get correct part ordered. Came in a reasonable time and worked perfectly. packaged properly, arrived in one piece in spite of the freight company. fit as it was supposed to. Just pick and click and presto you get your part. Much less grief than trying to get the local store to order it. The glass panel was exactly what I ordered and came in perfect condition. Thank you. We had to replace the inner glass on the oven door, looked it up on You Tube! the exact oven door and followed along. Super easy! Wall Oven - Built-in, Wall, Electric 30"